This listing is for a pack of 3 - 12"x12" cutting mats in standard grip. 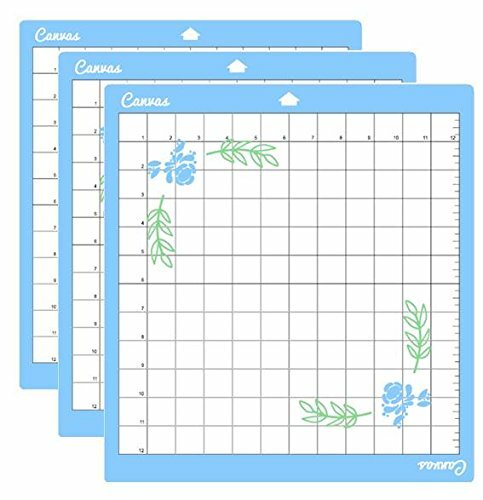 Unlike, other mats these are a perfect fit for Cricut and Silhouette machines. No slip. The mats are made with PP material making it more durable, bendable, strong and long lasting. . To ensure best performance use the recommended material types on each of the mats: Cardstock, Pattern Paper, Embossed Cardstock, Iron-on and Vinyl. Keep the clear film cover on the mat when storing to keep mat free from paper scraps and dust . Protect the cutter blade and improve the cutting accuracy. 12" x 12" standard grip adhesive cutting mat. Pack of 3. Perfect fit for Cricut and Silhouette Machines. No slip. Recommended materials for standard grip adhesive cutting mat: cardstock, pattern paper, embossed cardstock, iron-on, and vinyl. Durable, bendable and long lasting. If you have any questions about this product by Canvas, contact us by completing and submitting the form below. If you are looking for a specif part number, please include it with your message.